The 'Circle of Light' festival recently took place in Moscow, were architects, designers and artists working with lighting and projection systems came together to make the city even more beautiful. The festival opened in the most unfortunate of circumstances: the fine weather that the city had enjoyed all day gave way to a cutting wind and drizzle. When those fortunate enough to hold invitations managed to get onto Red Square, they took refuge under their umbrellas. There were not very many of them, compared to the size of the city’s main square – only about 20,000-25,000 people. In the middle of the square, the opening show was projected onto a large inflated globe that had been created by two Frenchmen, Martin Arnaud and Jean-Christophe Canizares. The show depicted the birth of the world through light. The images projected onto the globe were various and sundry: wooded landscapes, photos of children, a kind of eerie fire-red plasma, and even some acidic circles and patterns. Emphatically dramatic music alternated with electronic disco sound, and the show ended with a jubilant fireworks display; the explosion of lights on the secure facility opposite the Kremlin was probably the most sensational part of the festival. The inflated globe swayed in the wind and changed shape at the very moment abstract figures appeared upon it. In a nutshell, the lighting art on the square proved to be even more amazing than the artists had planned. The artists were being rather modest, however. At the press conference, Martin Arnaud said that the show had been designed for much better weather; although, on the other hand, it symbolized the conflict between the elements and, so, the wind and rain were just right. “Our project is packed with every possible kind of lighting effect and the latest, innovative technologies in the field of lighting design and environmental design. You can see everything within the city: even the bridges have been included so that the celebration of light would incorporate the whole of our city,” said Chernyak. The festival cost 400 million rubles – about $12.8 million. The organizers promised that it would pull in five million visitors, but a month ago that figure was adjusted to just around 3 million visitors. Maria Chernyak explained the figure: “We were basing our calculations on last year and looking at how many people these squares can handle. These are average, estimated figures.” In other words, Moscow officials simply calculated how many people, in principle, could pass through the areas where things were being displayed. The festival took place simultaneously on many squares in the center of the city – on Red Square, on Manezh Square, in Gorky Park, and so on. Displays included 3D projections mapped onto buildings, video art, and music and light shows. 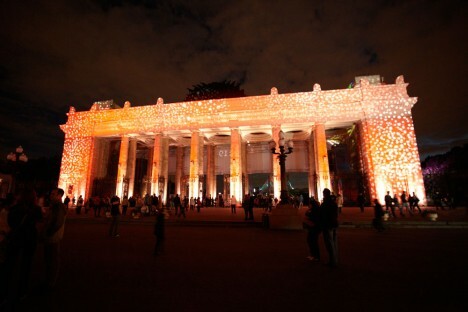 A program called the “Festival of Festivals,” which presented various important festivals of light from various cities and countries, was shown on the wall of the biggest art gallery in the city, the Central House of Artists.